Security screens are basically screen applications for doors and windows that offer supeior protection against outside heat, pests, UV rays of the sun and intruders. At Elite Glass Services we offer custom made screens that are a perfect complement to your house thereby enhancing the concept of indoor-outdoor living. Which kind of security screen are you looking for? Have a look below to find out what you need or contact us if you do not find here the security screen that you want. INVISI-GARD security screens provide an unparalleled combination of security as well as clarity of vision. Made from high tensile, marine grade 316 stainless steel and aluminium, they can be fitted to all standard windows and doors, and come in a wide range of colours to suit the décor. They can provide maximum protection to your family & your home. So, if you are looking for a security screen that can protect your family & home from would-be intruders, there is no other better product in the market than INVISI-GARD security screens. As an official holder of an INVISI-GARD license, Elite Glass Services are able to make quality products of this brand. 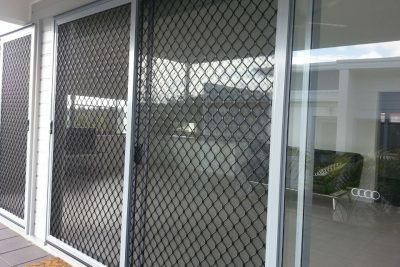 Having an expert team who has years of experience in this industry, you can be sure that you’re getting premier quality service in INVISI-GARD security screen manufacture. You can find Elite Glass doors for your home in standard frames, house cast panels and colonial-style. They may be folding, sliding or hinged. At first glance, the diamond grille designs of Elite Glass Services may look similar to other grille patterns. But if you take a closer look, you will find that there are no visible joints. It looks & feels as if the security screen is made in one single piece, which isn’t far from truth. Our security screens are not held together by rivets or screws, they are basically welded and that adds strength and enhances the look. You may choose between small diamond & large diamond designs. Both are economical and secure. The small ones are more secure whereas the large ones are more economical. Our diamond grille INVISI-GARD security screens are available for sliding doors, folding doors and hinge doors. No matter what you choose, you will have hundreds of colours and styles to select from when its us. Standard colours include black, pearl white, bronze anodised, clear anodised, rivergum beige and more. For a small additional cost, we even arrange custom powder coating of your security door to any colour in our powder coat range. Since 1962, Amplimesh has been providing security to the Australian families. 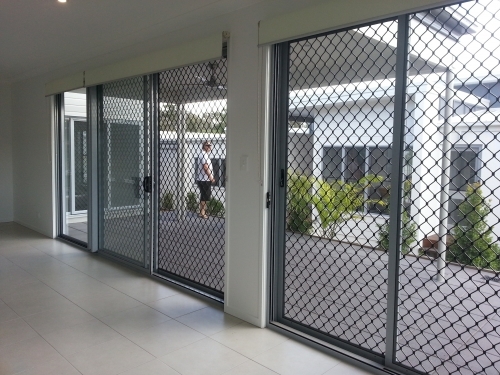 In fact, Amplimesh security doors can be found in millions of Australian homes. At Elite Glass Services we can custom manufacture the diamond grille Amplimesh door for you and provide a truly unobtrusive view of outdoors while letting breeze into your home. You can also protect & defend your home as well as family with our grille door. This definitely offers a visual deterrent & effective protection against all uninvited guests who wants to enter your house. We take time to make your door keeping in mind the exact measurements of your door frame. Our diamond grille doors can be made for folding, sliding and hinged doors.